Is your rear sagging, out of line and your rivets visible? Obviously the rear bumper on your much loved Jaguar, not anything else due to over indulgence at the Chequered Flag Ale house, The Castle Inn, The Apiary, The Lamb or The Jolly Potters! There, that should be worth a few complimentary pints! Joking apart, the rear bumper on your XK8 and XJ8, 1997 to 2006, can suffer from rear bumper droop due to the aluminium mountings and steel bolts corroding through electrolytic action, bulging out and sometimes splitting the hard plastic bumper bar. Bar off showing mounting broken. We’ve had two of these to do, so not a big percentage on sales so far, clues being a slight droop at one side and, even if the bumper looks lined up and all okay, you can just see a line of plastic rivet heads near the rear bodywork on the top of the bumper where they hold the bumper onto the bumper bar. Many times it’s just ignored as slight misalignment. Unfortunately as you wash the rear bumper then polish it a little more vigorously for the O.C. meeting/show/drive and…..it falls off! 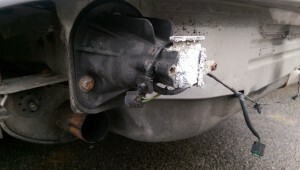 Shows corrosion on the bolt housing. Don’t laugh, it has happened! Very annoying and, if diagnosed early enough, an easy-ish fix. As usual a lot depends on how early you notice the problem. 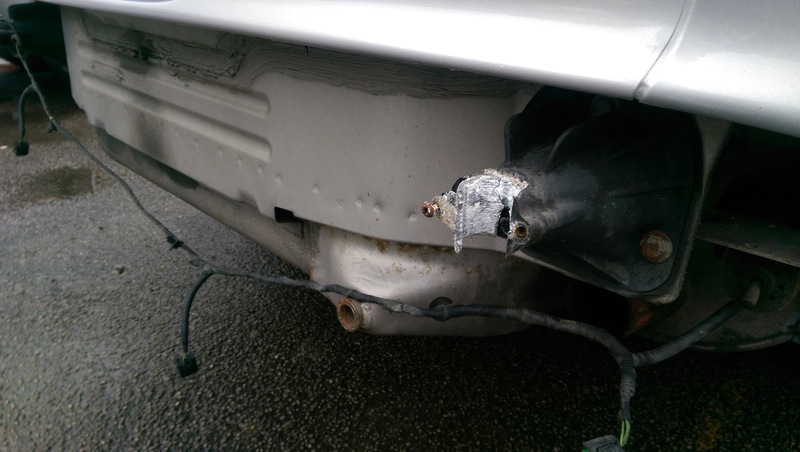 If the corrosion has gone too far a new bumper bar as well as the aluminium mounts will be needed. Our last bill for a car needing this work including bar added up to £600, December 2015. You can, if mechanically competent, complete this work yourself. It’s not too bad a job just awkward and fiddly getting corroded bolts out and correct alignment after it’s all back together. There are articles in most of the Jaguar Club magazines and posts in the on-line forums to help. Although as we know, once you’ve started one job making it easy to get access to any other problems around your rear end you could be at it for months. And we’re back in the Ale House……..! XK8 Corrosion problems need sorting – sooner than later! Classic Jaguar, Triumph, Aston Martin and more, all on the telly – every day! Jaguar XK8 feeling wobbly, shakey, skittish? Check your mounts! 2008 MY Jaguars at Classic Car Auctions. Running short of classics?